Preheat oven to 200°F. Cover large baking sheet with parchment paper. Beat egg whites and cream of tartar in large bowl with electric mixer on medium speed 5 minutes or until soft peaks form. Gradually add granulated sugar, beating on high speed. Add icing sugar, 1 Tbsp. at a time, beating well after each addition. (Meringue will begin to turn glossy.) Continue beating until stiff peaks form. 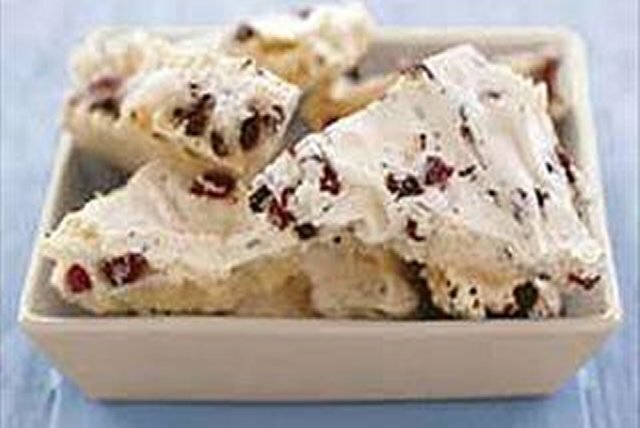 Stir in cranberries and chocolate. Spread onto prepared baking sheet to within 1/2 inch of edges of baking sheet. Bake 2 hours. Turn oven off. Let meringue stand in oven for 1 hour 30 minutes to 2 hours or until meringue is cooled and completely dried. Cut or beak into 24 pieces. Store in airtight container at room temperature. Meringue will be crispy. Don't worry if it breaks apart into uneven pieces. That is part of its charm. This nonstick, non-burn paper is the best way to line a baking sheet. Look for it in your supermarket. It can be wiped off and reused for multiple batches of the same recipe. In the case of meringues, it is the best way to prevent sticking as a greased pan would interfere with how the meringue bakes up. Meringues will turn chewy if exposed to humidity. For best results, store the merinuge in an airtight container at room temperature for up to 2 days.